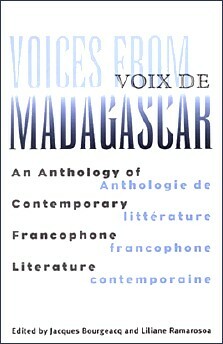 Voices from Madagascar : an anthology of contemporary francophone literature = Voix de Madagascar : anthologie de littérature francophone contemporaine / ed. by Jacques Bourgeacq and Liliane Ramarosoa. - Athens (Ohio) : Ohio university press, 2002. XXV-314 p. : ill., map ; 22 cm. - (Research in international studies, Africa series, 75). NOTE DE L'ÉDITEUR : There is currently in Madagascar a rich literary production (short stories, poetry, novels, plays) that has not yet reached the United States for lack of diffusion outside the country. Until recently Madagascar suffered from political isolation resulting from its breakup with France in the 1970s and the eighteen years of Marxism that followed. With little hope that their voices would be heard outside the island, writers nevertheless have continued to express themselves in French (alongside a literature written in the Malagasy language). Malagasy literature in French had begun in the colonial era with three poets : Jean-Joseph Rabearivelo, Jacques Rabemananjara, and Flavien Ranaivo, all three presented in Léopold Senghor’s celebrated Anthologie de la nouvelle poésie nègre et malgache (1948). More recently, although a few Malagasy writers living outside the country have been published in France, the bulk of Malagasy literature today has remained largely unpublished, circulating locally mostly in manuscript form. Voices from Madagascar will bring a wide selection of these texts, both in French and in English, to the North American public. Cette anthologie présente, en français et en anglais, des poèmes et nouvelles de Jean-Joseph Rabearivelo, Jacques Rabemananjara, Flavien Ranaivo, Dox, Lucien-Michel Andrianarahinjaka, David Jaomanoro, Jean Luc Raharimanana, Christiane Ramanantsoa, Narcisse Randriamirado, Serge Henri Rodin, Bao Ralambo, Jean-Claude Fota, Lila Ratsifandriamanana, Alice Ravoson, Esther Nirina, Henri Rahaingoson, Lila et Rado. ❙ Jacques Bourgeacq enseigne le français à l'Université de l'Iowa. ❙ Liliane Ramarosoa, spécialiste des littératures francophones de l'océan Indien et d'Afrique, enseigne à l'Université d'Antananarivo.